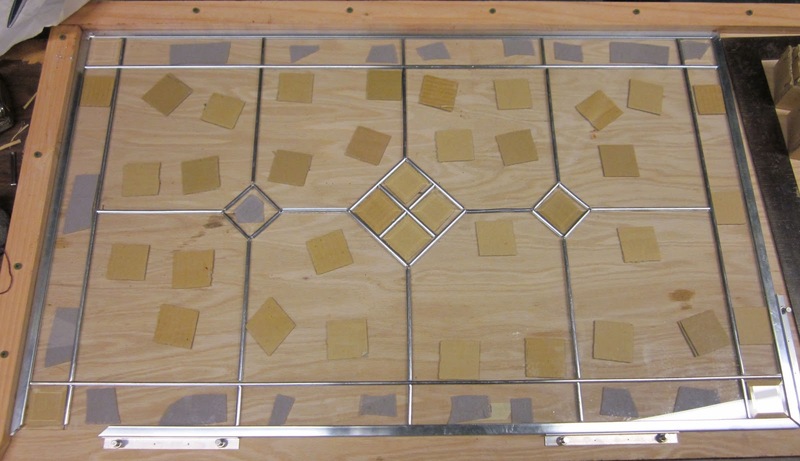 Today we built our first colonnade leaded glass panel! This is the largest panel we're doing for this project of ours. Our building process has gotten pretty efficient. Once Jeff figured out how to print the pattern pieces for the leaded glass from his computer, our speed more than doubled. 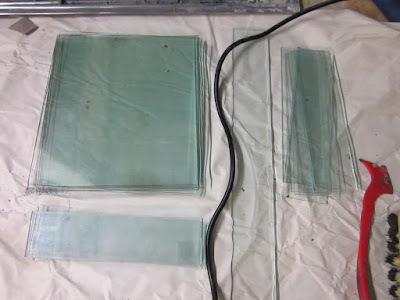 And the glass pieces are so uniform Jeff was able to print out only ONE pattern piece (one of the interior rectangles) and we were able to size all the other pieces off that one. 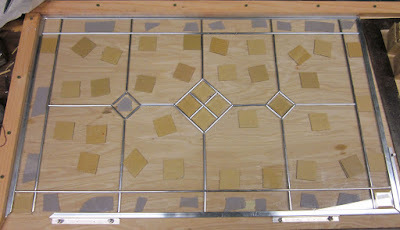 We also successfully built this panel without the large overall pattern, saving a lot of effort. These pieces are uniform enough we can just cut them out and put them together. Also, once Jeff figured out we should use the strip cutter, our pieces became very uniform and fit together quite nicely with little grinding. 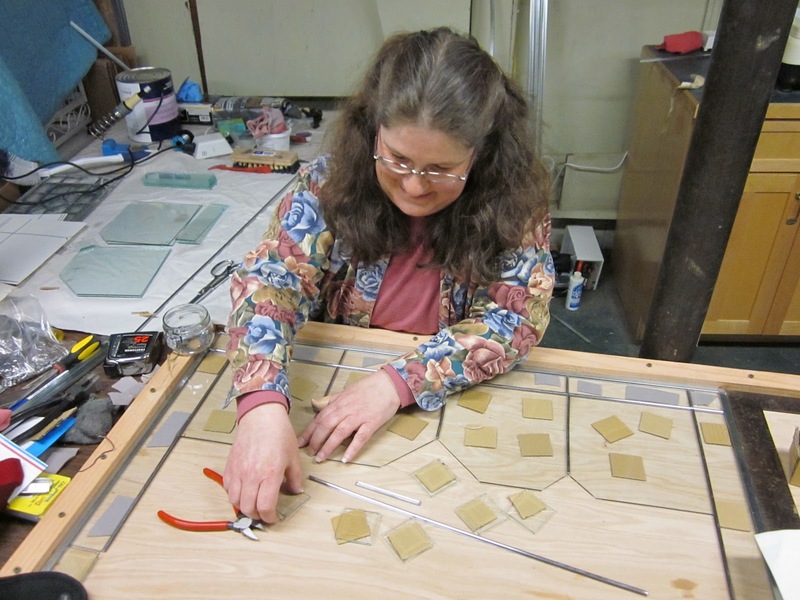 So, what we've figured out to do is to work together and strip cut all the pieces for the panel. 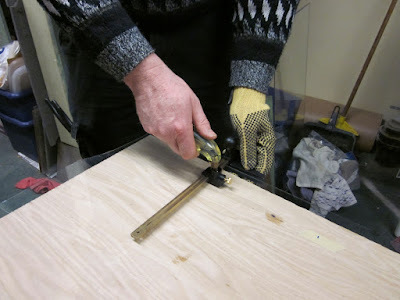 Then we go back and do the final shaping for fitting in the bevelled squares. 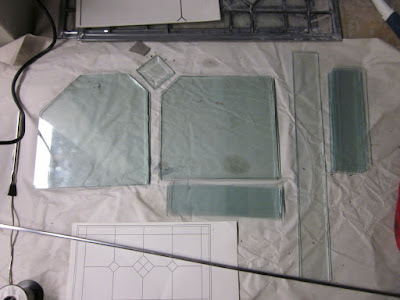 Then once we've shaped all the pieces, we simply put the panel together, adding lead came between the pieces of glass. Putting the leaded glass panel together! It has also helped soldering three sides of the zinc border together, because then we are more likely to get an easier fit for the fourth edge. And now we're shopping around for tiny wood mouldings to install them in the cabinet doors. 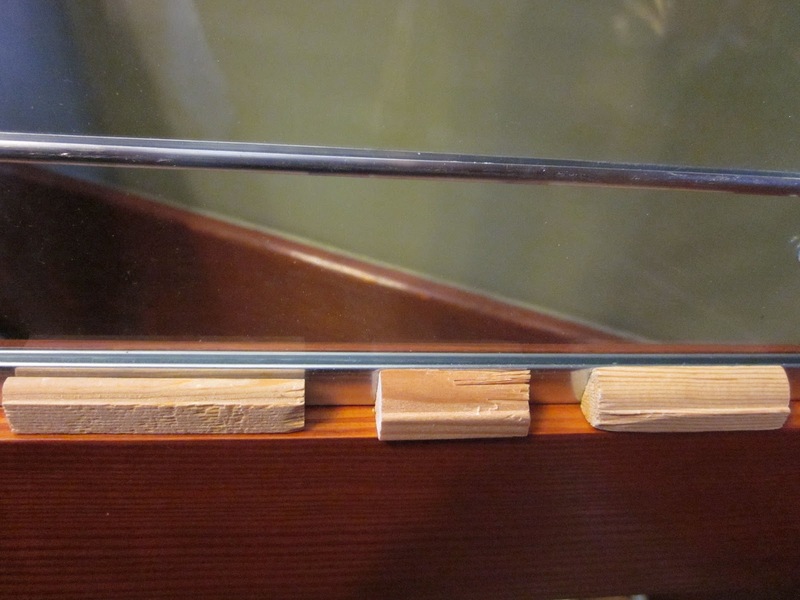 Isn't it amazing how some of the newer technology can help with the older craftsmanship? That's great. The glass panels look really awesome! I've always wanted to learn how to do leaded glass designs. Did you take a class, or is this something you picked up by reading/practicing? 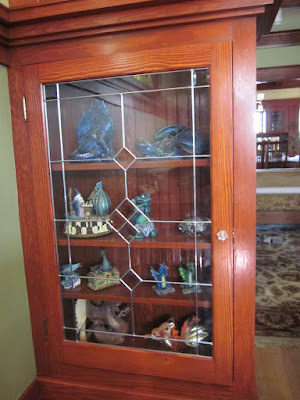 Boe, Jeff took a short class on making leaded glass. It showed him the general technique. But we also do a fair amount of research to figure out details like the strip cutting. Also, there are some good books on leaded glass we found helpful.